Take a historic covered-wagon trip near Chimney Rock, Nebraska. Enjoy great food at the nightly chuckwagon cookouts. See original wagon ruts from the Oregon, California and Mormon trails. 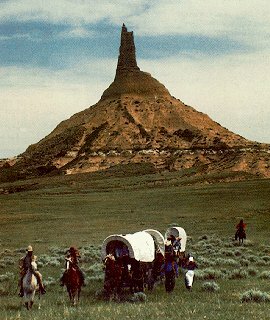 Travel picture of Wagon train beneath the spire of Chimney Rock. do you have a trip running first week of AUg? if so can you pls send me info. Can you send information on the wagon train tour please. Dates and prices, etc. I am looking to get information on your tours. Can you please send me information for them. Thank you so much! Please email me information for summer 2012. I would like information about the wagon train tours of the Oregon trail. Please send dates, prices, brochure, and any other pertinent information for 2012 -2013. Read once that there was a wagon train adventure, where you could either ride a horse, on the wagon, or walk, this sounds like a grea adventure and a way to experience history. Please send me a brochure regarding any Wagon Train Tours especially those near / on the Oregon Trail. Please send dates/prices and other info re-a possible holiday in 2014.